Bad Cabbage with a Side of Slaw: Oh. My. God. Do you see what I see? 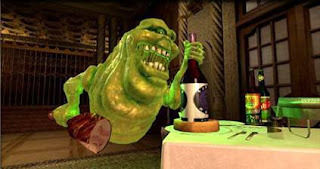 That's Slimer, baby. And he's back in what msn.com is calling one of the most anticipated video games of 2008. Ghostbusters: The Video Game. More like most anticipated game ever (for this guy, at least). The only movie I quote more frequently than Ghostbusters is Wayne's World, so you must know this: I am giddy, more so than when I heard my mom won the lottery. Why, you might ask, is this video game so special? It's not like they're releasing Ghostbusters 3. And if I were in Boston, I'd say, "Stawp right there." The clip says that it will be released for most gaming consoles. If the game is not produced for PS2--the system I own--then it looks like I'm going to have to change my tax rebate plans. Economy, prepare to be stimulated. The Ghostbusters are back! Ray "Huey Lewis" Parker, Jr.
Release date, Dan, I need a release date! "Bustin' makes me feel goooood!" Yeah, I kind of dropped the ball on that. I was too excited to even do a quick bit of research. Turns out that this "news" was announced back in November. Where was I? The game will be shipped in Fall of this year, according to the gaming blogs. Also, it will not be produced for Nintendo's Wii. Good. About the Wii. I think that's the most ridiculous game platform ever made. It has several flaws. 1)it requires physical effort. 2) the graphics aren't that great. Nintendo graphics tend to be rather childish and elementary to begin with, but Wii is just horrid. A bunch of my friends got one and raved about how awesome it was. Now they're all back on the PS2 or 3 or Xbox.